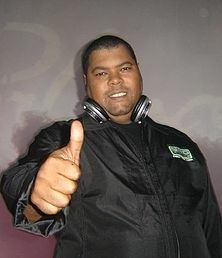 Rodney Sebastian Clark Donalds (born October 27, 1969), better known by the stage name El Chombo[note 1], is a Panamanian producer and artist. El Chombo is best known by non-Spanish speaking audiences for the hit nonsense pseudo-Spanish song "Chacarron Macarron", which has become an Internet phenomenon, and because of its mumbling vocals and nonsensical "lyrics", he earned the nickname El Mudo. His major local hits under his own name include "Kung Fu", "El Gato Volador", "Chacarron Macarron" and "Dame Tu Cosita" (as El Chombo). Rodney created an EP called Macarron Chacarron containing many mixes of his hits, which is available on iTunes. As a producer, he is best known for producing Lorna's 2003 hit single "Papi chulo... (te traigo el mmmm...)", which served as an introduction of reggaeton for many Europeans, reaching number one in the French charts with top ten appearances in Greece, Italy, India, Turkey, and the Netherlands. In 2006, there was a campaign on BBC Radio 1 in the UK to get the song "Chacarron Macarron" to number one; in the end, it only reached number 20 in the charts. His song "Dame Tu Cosita" became a viral Internet dance challenge and meme in March 2018. "Papi chulo... (te traigo el mmmm...)"
^ In Panama, Chombo refers to a black person but is generally a derogatory term. ^ Jamison, Lee (2018). Panamanian Spanish: Speak like a Native!. p. 12. ISBN 0-692-75886-0. ^ "El Chombo Chart History (Canadian Hot 100)". Billboard. ^ "Discographie El Chombo" (in French). ^ "El Chombo Chart History (UK)". ^ "El Chombo Chart History (US)". Billboard. ^ "El Chombo Chart History (US Latin)". Billboard. ^ "HOT 100 20 de Octubre de 2018 - Billboard". Billboard. ^ "Lorna - Papi Chulo... te traigo el mmmm". ultratop.be. ^ Hung, Steffen. "lescharts.com - Lorna - Papi Chulo... te traigo el mmmm". lescharts.com. ^ Hung, Steffen. "italiancharts.com - Lorna - Papi Chulo... te traigo el mmmm". italiancharts.com. ^ Hung, Steffen. "Lorna - Papi Chulo... te traigo el mmmm". hitparade.ch. ^ Hung, Steffen. "spanishcharts.com - Lorna - Papi Chulo... te traigo el mmmm". spanishcharts.com. ^ Hung, Steffen. "swedishcharts.com - Lorna - Papi Chulo... te traigo el mmmm". swedishcharts.com. ^ Hung, Steffen. "Lorna - Papi Chulo... te traigo el mmmm - hitparade.ch". hitparade.ch. This page was last edited on 22 February 2019, at 03:25 (UTC).